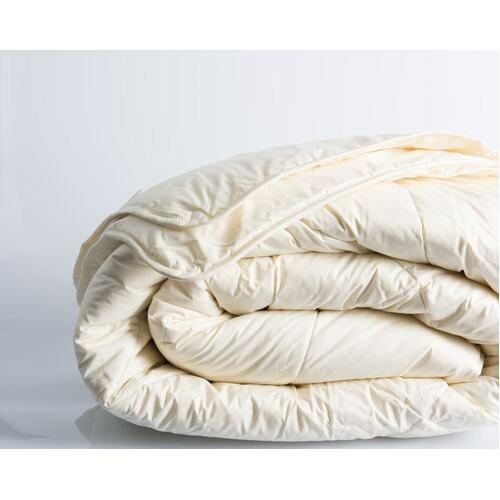 Surround yourself in luxurious clouds all year round with the Four Seasons Quilt by Sleepvale Australia. Made with premium Australian Wool, the 600gsm Four Seasons Quilt gives you ultimate quilt versatility using a 2-in-1 quilt design. 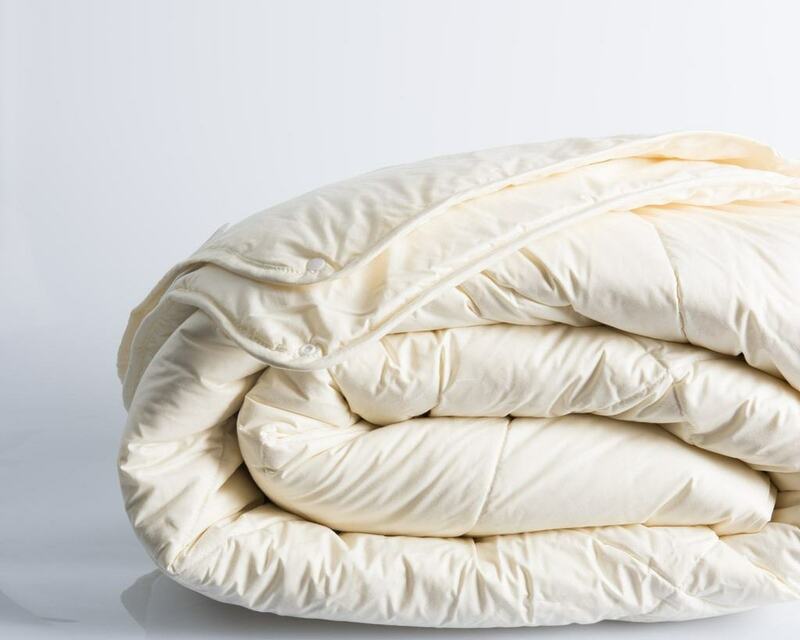 Then experience the 200gsm lightweight, body-regulating summer quilt in the warmer seasons. 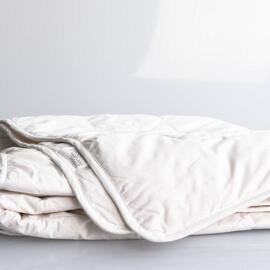 Connected by a durable button clips this quilt also houses cotton percale casing. These comfortable wool quilts suit all sleeper styles and work wonderfully throughout the year! Partners who have different sleeping temperatures can both enjoy the long sought-after weighted feeling of a high-quality quilt. 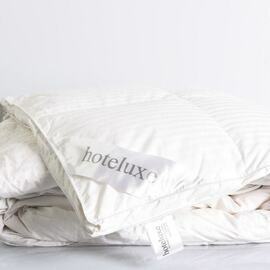 Each Australian Wool Quilt is quilted with a premium diamond design to prevent cold pockets so you can enjoy luxurious warmth each and every night. Four Seasons Quilts make excellent bed displays because of their evenness and cozy, fluffy appearance thats as comfortable as it looks! The wool quilts are fully machine washable and easy to maintain. Natural Australian Wool is excellent for trapping and retaining warm air as you sleep. 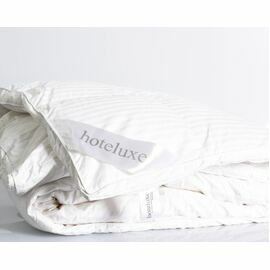 Paired with the diamond quilted design, Hoteluxe quilts keep you all throughout winter. A Double quilt on a Double bed is sufficient where the mattress is slow and only one occupant is sleeping on the bed, otherwise a queen quilt would offer better coverage for a more optimal sleeping comfort. Note the queen is only wider than the double, but the length remains the same. A Queen quilt is normally sufficient for standard queen size height mattresses upto 30cm, but today most new mattresses are fitted with extra layers such as memory foam and therefore, to achieve a nice look you need to upsize to a king size quilt doona. Note, the king quilt is only wider, the length will remain the same. If you have a high mattress and find the quilt feels small, we have a super king quilt doona available, just few things why upsizing note, that when upsizing from King to Super King. Both the width and length of the quilt are larger by 30cm (or approx. 15cm each side). That 15cm on each side is normally sufficient to achieve that optimal look. An easy decision, just note, when choosing a doona, given the size of the quilt, id normally avoid heavy quilts if you have problem with weight as it tends to become a lot heaver. Thats why down quilts or mid filing quilts tend to be popular with super king. Given the larger size, the air pockets become trapped as there is no cold spots coming in, therefore, you dont need a heavy quilt (eg. 600gsm wool doona) unless you prefer that extra weight. The Ultimate Four season quilt is enriched with 100% Australian Wool in a 600gsm filling, so you can experience the blissful warmth all year round. This versatile trans-seasonal quilt offers the perfect option whether you need superior warmth in winter or breathability during Spring. After a busy working week, you dont want to spend hours of your weekend hand washing quilts, or running to the dry cleaner hoping to have it back the next day. Our woolen quilts with pre-shrunk cotton japara covers allows the quilt to be machine washable which will save you hours of your weekend! You dont need to compromise your nights sleep anymore. Our woolen quilts are naturally hypoallergenic, inheritently resistant to dust mites.